Eberspacher heaters are very safe provided they are properly installed by a dealer. This website is designed to cover their maintenance and repair. It is NOT designed as an installation guide and we do not cover most installation details. We know that despite our advice to use a dealer some users will inevitably install it themselves. You do this at your own risk, we accept no responsibly for DIY installations. Read the manuals carefully and follow the Eberspacher or Espar guidelines to ensure it works properly and is safe. Boat installations must also comply with the relevant regulations. Bad installations can be dangerous and could invalidate insurance. Why buy an Eberspacher heater? Eberspacher (Espar in America & Canada) heaters are mainly used in vehicles to supply heat when they are stationary. They are also fitted in boats and caravans. They can run on the vehicle or boats fuel supply. We use Eberspachers in our vans and Dereks caravan and for us they are the best and cheapest form of portable heating. Running the engine when stationary uses a great deal of fuel. LPG heaters need heavy gas cylinders and are very expensive to run compared to diesel heaters. It is difficult to gauge when they will run out and gas leaks can be explosive. LPG when burnt produces carbon monoxide which can kill. Exhaust gases from Eberspacher heaters should be avoided but CO levels are low, there have been no recorded deaths. Solar and wind power do not give enough heat. Alternative diesel heater manufacturers have no equivalent website to ours for free advice on servicing and repairs. There is a well known law that says they always fail when you are at least 100 miles from your nearest dealer who is of course closed for the evening or weekend. Eberspacher model naming is confusing. Older models had a naming convention, newer models do not follow this system. First Letter - D diesel, B petrol. Letter - L air, W water. Older models only, newer models do not use this convention and use L for Large. Any letters following identify the model, eg D1L, D1LC, D1LCC. 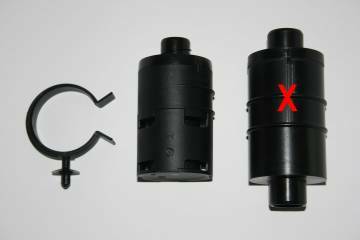 They were manufactured in the order D1L, D1LC, D1LCC, with Airtronic D2 being the current model. D4L, D5L, D5LC, with Airtronic D5 being the current model. The Air Heater Models pages contain information on Eberspacher models. Oldest models D4W (not sold in UK), D5W, D7W, D9W, D10W. Stating the obvious, when identifying models always look at the label. Labels show 3 consecutive years, eg 01 02 03. All you can tell is the heater was made in 2001, possibly earlier, and probably first installed in 2001, 2002 or 2003. Be very careful identifying models. We know of a number of buyers who have purchased a D1L model instead of the D1LCC they actually wanted. 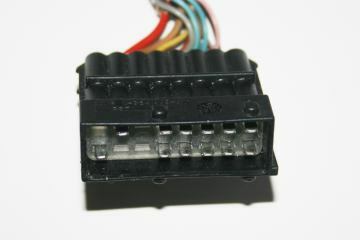 Photos on Ebay are sometimes taken to partially conceal the external ECU and relays, often by placing them among the controller and cables so they are not very obvious. That bargain price may not be such a good bargain after all. 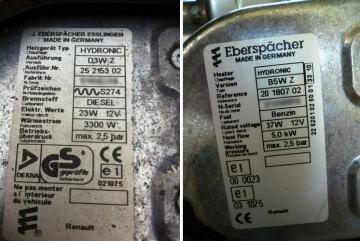 New heaters sold from Turkey are said to be OEM versions and are not supported by Eberspacher UK. Look very closely at what is being sold. Eberspacher air models require a pump, controller and wiring loom, many are removed from vehicles without these and sold without them, the pump could cost another £75, wiring loom £45, controller £40. Water heaters usually also require a water pump. Some water heaters have the fuel pumps built in. Heaters and pumps are made in 12 and 24 volt versions, check before buying. 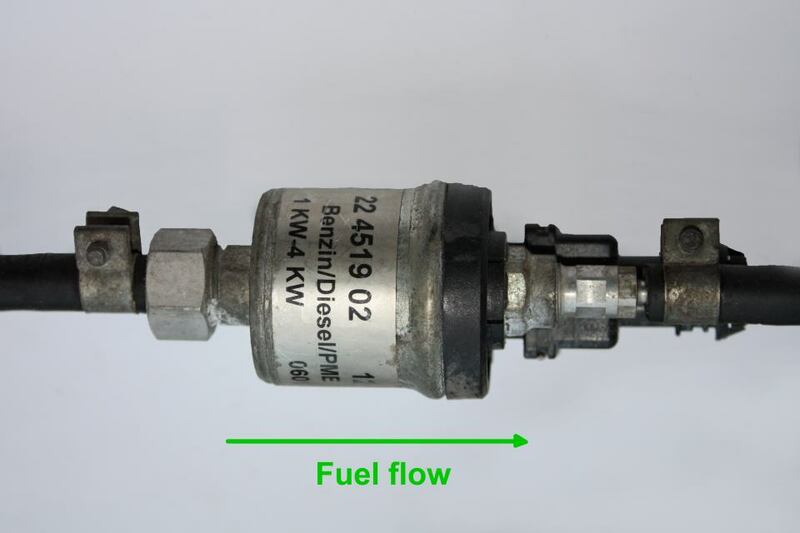 Pumps are specific to the heater type some can be adjusted, see the fuel pages for details. If you do have to buy a new controller get one with diagnostics readout, invaluable when fault finding. "Working" Eberspacher air heaters are not cheap so you may be tempted to try buying others, usually not a good choice. Unlike many items sold on Ebay you are unlikely to find any with simple cheap to solve faults because of the following points. Eberspacher owners are not like many typical Ebay sellers who will update every couple of years to the latest model or as soon as anything gives a problem. Many heaters will have been fitted in trucks, if the engine has to be run to keep warm the truck uses a lot more fuel than an Eberspacher so it is cheaper to fix the Eberspacher. Boat owners congregate in marinas or harbours, inevitably there will be someone there who knows something about Eberspachers and also knows they need regular servicing together with details of dealers. Inside the heater, apart from needing annual service there is little to go wrong and when it does it is normally the expensive ECU. On older model heaters the glowpin often fails but it is easy to remove and visually check and replace so it will normally be fixed. Simpler faults are usually sorted out before selling, the detailed advice given on our site has also reduced the chances of a cheap fixable bargain! "Working when removed from vehicle". Testing would increase the selling price so why didn't they test it before selling. Don't assume it was removed recently or that it is has everything needed to run. Warning: Make sure you read the non standard heater section below, if you buy one of these you will make an expensive mistake. A good seller should accept returns if it is untested, check before purchase. Always bench test the heater as soon as it is received, it is also easier to sort out on the bench than when installed on the boat. "Believed to be working when removed" or wording in a similar vein, usually phrased to lead you to think it will probably work so worth buying. Some are said to have been tucked away in a garage or shed for a few years. Usually sold without the bits needed to test as soon as it is received so testing may be done months later. Generally a no guarantee or return allowed listing. If it means making money many sellers will deliberately mislead, unethical but we see lots of examples of it. Don't be gullible, treat it like the next category. "Unable to test so selling as spares or repair". This is often used to conceal serious problems, in reality it usually means "I know it is faulty but if I said so it would go for a very low price". Most will be faulty, usually with ECU faults and if you buy one you will not be able to return it as it is as described. A new ECU costs over £250 so you could easily end up paying almost the same price for a used heater as a new one. Corrosion and motor problems are higher than with air models. Advice from experienced users would be welcome for inclusion. Do not buy a heater with a Z in the model name, these are OEM heaters as shown below. They are not supported by Eberspacher or their dealers. The Hydronic II D5WZ does not have manuals so no wiring diagrams available. Some OEM Eberspacher heaters are manufactured with ECUs modified to the vehicle manufacturers specifications so the heater can be controlled by the vehicles engine management system. They are not switched on and off in the normal way so cannot be made to work with simple wiring changes. Often these will be described as removed from ***** vehicle. Sometimes they will be sold as "Working when removed from vehicle", that may be true but many wont work away from it! DO NOT BUY any of these non standard versions for normal use, you will be wasting money. Most will not work on their own without replacing the ECU which costs £250 to £350! Also a few controllers have been modified to work with the engine management system and wont work away from it. Non standard air heaters often have a different connector and non standard colours, the labels are a good warning. Scania, Mann, Mercedes, Iveco, Renault, Daf are manufacturers who fit modified heaters but there are probably others. These are mainly Airtronics D2 D4 models but we know a few D1LCC are included. Any water heaters with the letter Z such as D3WZ, D5WZ are OEM heaters, most will be non standard so do not buy. However one user reported he bought a Hydronic II D5WZ and was able to get it working ok. I have the wiring details available. A reliable source has advised us that a DAF D2 ECU Part number 22 5102 00 14 01 DAF1455175 bought on ebay had the normal plug and works as a standard unit. However another DAF ECU 22 5102 00 34 01 DAF: 1665022 has a different connector and is non standard. Scania ECU 22 5102 00 11 01 0C is confirmed as definitely not a standard unit. 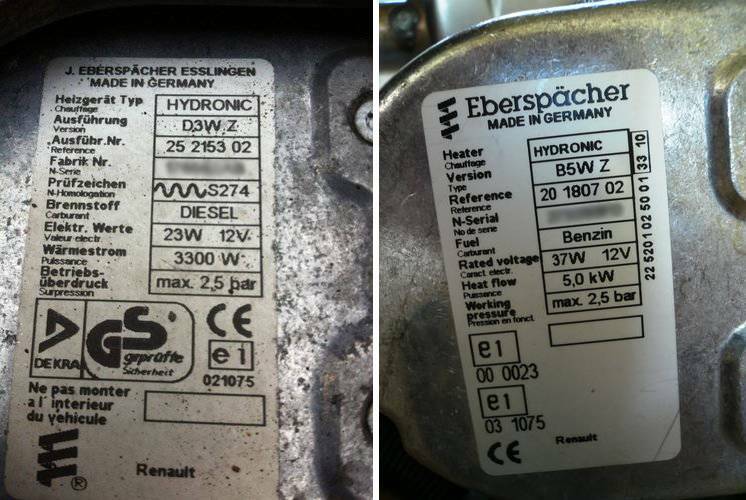 Labels on two Hydronics sold as removed from Renault vehicles. Note the Renault name at bottom. "Eberspacher D4 ECU Removed from a Man truck had a broken plug so unpinned ready to fit another new it was fully working before removing plug." An Ebay sellers listing, nothing untrue but the telltale ECU plug not shown and no mention of non standard. I leave you to draw your own conclusions on this one! Sizing depends on insulation etc as well as level of heat required, some just require background heat others want it like a sauna. We have a D2 or a D1LCC in our Transit vans and a caravan. Dealers should be able to give more advice. A general rule of thumb is 120 to 200 watts per cubic metre. Alternatively you could try a mains fan heater to see how much heat is needed. A D4 Plus has a more powerful fan than a D4 so can have longer air ducting. The following information from Eberspacher gives a general starting point for boats, also talk to fellow boat owners. There is no cheap conversion method to change voltage inside the heater so check before purchasing. However it is possible to use voltage converters to change 12V dc to 24V dc or 24V dc to 12V dc. Operationally I have reservations about the use of converters and would prefer not to use one myself but they can work. Switching on the heater before the converter can cause problems for the ECU, sometimes it can be recovered ok but not always. The heater must be allowed to go through its 4 minute shut down cycle before switching off the converter. That inevitably means switching off the converter could be overlooked, the converter continues to draw some current all the time it is on. Converters are not as convenient and take more current from the battery than using a correct voltage Eberspacher. For those unfamiliar with electronics a bit more explanation on this point. A 12V Airtronic D2 takes a maximum of about 10 amps, a 24V Airtronic D2 takes about 5 amps. The 24V version's 5 amps may look better but in fact it is exactly the same amount of power. When a voltage converter is used it changes the voltage from 12 to 24 volts, the current drawn by a 24 volt Eberspacher D2 is about 5 amps, the current drawn by the converter from the 12 volt battery will in theory be double that at about 10 amps which is the same as a 12 volt D2. In practice converters are not 100% efficient so actual current drawn at 12V will be significantly more than that figure. A major problem would be if the converter has insufficient smoothing. This could result in the Eberspacher not working properly even though the current rating is sufficient. I have no practical experience of using either type of high current converter so my concerns are purely theoretical. I do know of one user who is running a 24v heater with a 12v converter without problems and another who had problems so replaced the heater. Ebay had a listing in Feb 2012 for a DC 12V to 24V 10A 240W Step-Up Power DC-DC Converter for £32.85 That 10 amp rating is for the 24 volt output and is sufficient only for a D2 or D4, not for other air heaters which need a higher rating. In April 2014 an Ebay search for 24v to 12v converters gave lower prices than the same devices searched for with 24v to 12v droppers. A 30 amp max 24V to 12V converter was about £4.50 These two examples just illustrate prices, no information is given on smoothing and no guarantee they would work without problems. A small number of heaters suffer from corroded ports. We suspect it is due to galvanic corrosion between the alloy port and the stainless steel pipe. A very badly corroded exhaust port could require a new heat exchanger. Photos on fault page. We are currently investigating a couple of repair methods, we have the tools and pipe ready for trying, details will be added when we have time to experiment. Contact us if you require these details. This part only covers ancillary items where we can give additional advice to readily available information. Do not skimp on power cable size as doing so will cause frustrating intermittent low voltage failures. Much thicker power supply cables are needed than you would expect from the amperage figures in the manual. The reason for this is to reduce the voltage drop in the cables. Full details are on the Low voltage and wiring pages. For the D2 / D4 heaters which draw up to 10 amps during starting Eberspacher recommend 4 mm2 wires for up to 2.5m individual wire length; ie 2.5m positive wire and 2.5m return wire. Increase the cable size to 6 mm2 up to 4m, and 10 mm2 or more for longer runs. Current rating for these cables is quoted by some sources as 4 mm2 cable 32 amp, 6 mm2 40 amp and 10 mm2 55 amp. Older models and the Airtronic D5 take about 20 amps during starting and for these the cable sizes should be doubled. If you you are tempted to use some old cable with an unknown rating check it for size against those shown on our Wiring page. The controller and other wiring carries less current so can be run in almost any normal cable thickness. Eberspacher air heaters require a temperature controller, these are on the controllers page. Seriously consider buying one with diagnostics facilities like the 801 or the 701 (with blue logo, not white). Diagnostics really do help when you have problems and can often save hours of investigation or dealer charges. A single controller position may not be ideal. It is possible to install two separate controllers. Typical use is to have one in a main area and a second controller reachable from a bed, more details controllers 4 page. Contact with the hot exhaust can cause painful burns or might start a fire. Also the fuel line may pass fairly close. We recently measured the pipe and it was about 105 deg C, close to the boiling point of water, much lower than expected. However under fault conditions it can get much hotter. Here it is spiral lagged using 50 mm glass fibre tape. Insulating sleeves are also available. Try Ebay or Google "Exhaust lagging" for stockists. Eberspacher Inlet / outlet pipe connections are in several sizes so check the manual for the correct size. 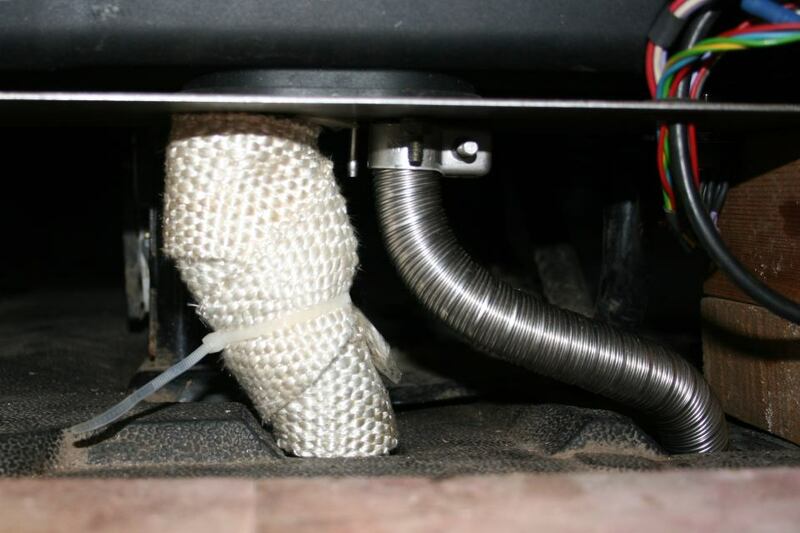 Flexible exhaust pipe can make installation easier. The combustion air inlet pipe (right) does not have to be metal. Both pipes should be at least 200 mm long. The combustion air must not be drawn from living areas. 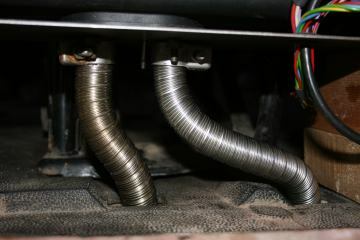 Some very old heaters need the inlet same length as exhaust. See below for clamps. We consider a silencer essential to reduce noise to neighbours. The noise reduction from the vehicle type silencer is fair, some users fit two to give a bigger reduction. They are not gas tight and must not be used in enclosed spaces. Check your pipe size before buying, 22 and 24 mm are often listed on Ebay. 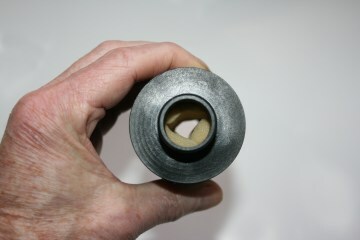 Views of the non gas tight seams and a silencer cut open are on the Silencer Autopsy page. Webasto versions have a drain hole in the casing. 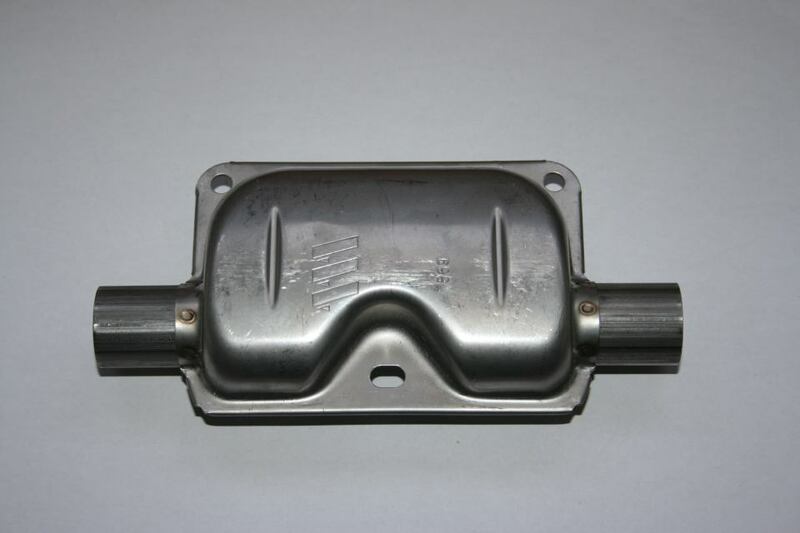 Vehicle type exhaust silencers are unsuitable for marine use. Better marine silencers are available from a dealer, they are gas tight and are much quieter. 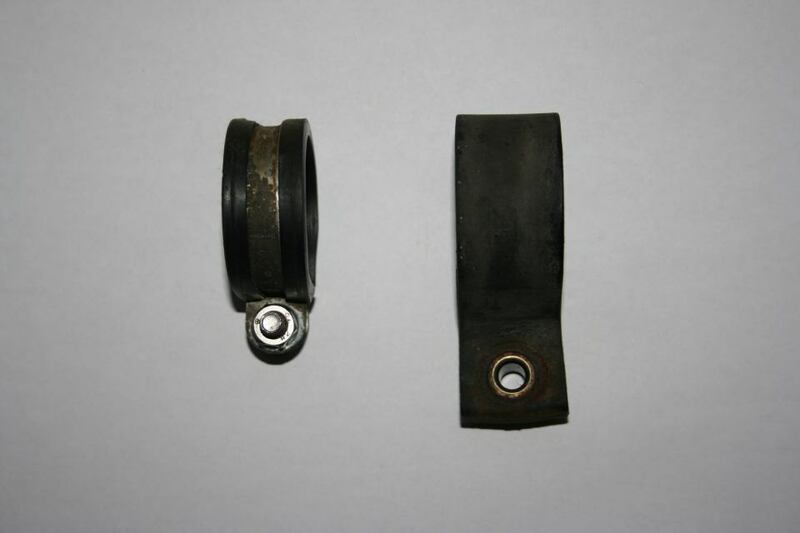 Use good quality clamps on exhausts and silencers to ensure a gas tight seal, two suitable types are shown. Jubilee type clamps do not tighten enough to compress the pipe. 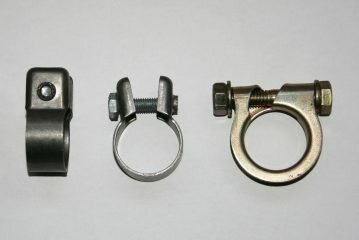 The cheaper U shaped clamps sold on Ebay from Turkey, not shown, are thin metal and are totally unsuitable for exhausts. The combustion air inlet is a lot quieter than the exhaust but an inlet silencer can make a reasonable noise improvement. Derek has one on his D2 but on my D1LCC I just have an exhaust silencer fitted. Eberspacher also have a range of tubular inlet air silencers, check with dealers for details. We bought a cheap air inlet silencer from Turkey on Ebay to evaluate but it was such poor quality we looked for an alternative. 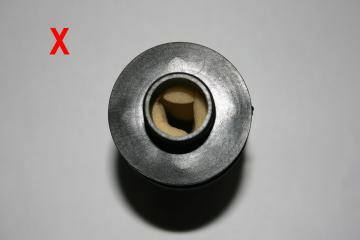 Both silencers have similar construction with a central tubular path that should allow the air to pass without obstruction. Foam encircling the tube absorbs some of the noise, unlike a filter the air does not pass through the foam cells. Webasto combustion air inlet filter. End parts unclipped to show construction. It can be installed in middle of pipe as well as at end. Construction quality of this silencer is very good. Air passage through it is 100% clear. Black silencing foam looks good quality. 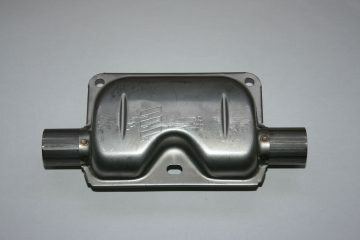 Two combustion air inlet silencers. 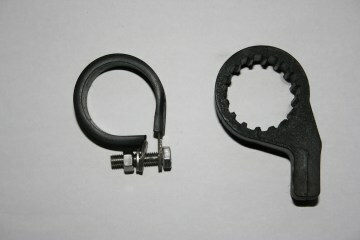 Webasto filter on the left fits 22 mm tubing and came with a mounting clamp. 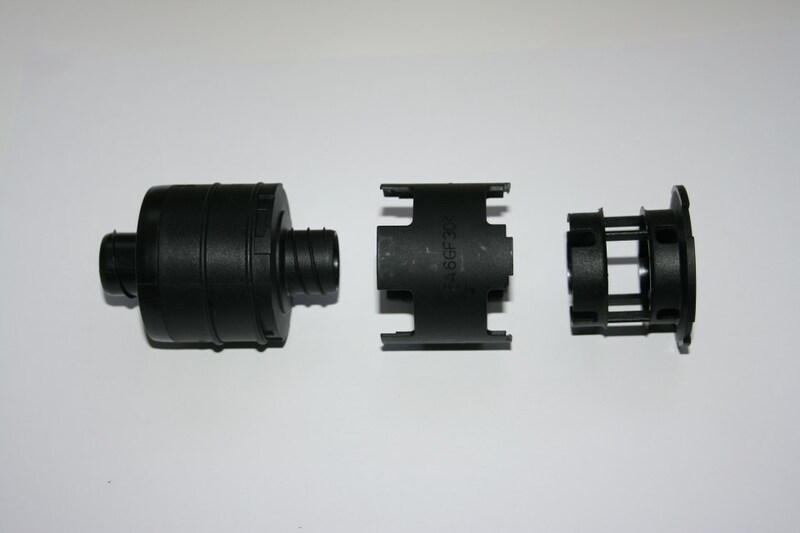 Filter from Turkey right is poor quality, fits 25 mm tubing, is about 125 mm long overall and costs more. Badly made filter from Turkey, foam part blocking the air path. The sponge looks cheap raising concerns as to how long it will last, if it breaks down pieces could enter the heater.We do not recommend this air filter. Sucking and blowing through the tube is not a scientific test but as expected a higher air resistance than the Webasto. We estimate that the clear area in the tube is only about a third of the total area. Each Eberspacher air heater has a rating for maximum permitted heating air ducting length, exceeding this can cause overheating. Fittings such as bends, outlets etc can rapidly exceed this allowance. Each heater also has recommendations for the diameter of the ducting. Check length / number of fittings etc is within specification, details are on our ducting pages. Heat loss from hoses running through lockers can be considerable, reduce this by adding insulation round them. Items such as Screwfix loft insulation provide a neat solution. Ducting should have a high temperature rating, early on we bought some plastic hose advertised as for Eberpachers and it melted on test. Another useful tip: Consider very carefully if the output(s) could be accidentally blocked, usually by bags or luggage. Sometimes this can destroy the ECU. If you cannot guarantee they will always be clear split the duct to feed multiple outlets so one is always clear, or fit protective cages. Right angled outlet hoods can use up to half the duct length allowance. Use the straight hood and a gentler hose bend if space permits. Right angled outlet hoods on a D4 are allowed. 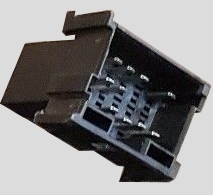 Right angled outlet hoods must not be fitted on a D4 Plus as they cause excessive turbulence and case damage, it is ok to fit a straight hood immediately followed by a 90 degree elbow. 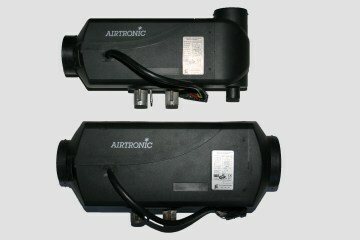 Airtronic D2 and D4 pump. Second hand Eberspacher heaters are often sold without pumps so used pumps are always in demand and are not cheap. Some used pumps may have been mounted under the chassis and the case can be corroded but this is generally not a problem as they are designed for external mounting. 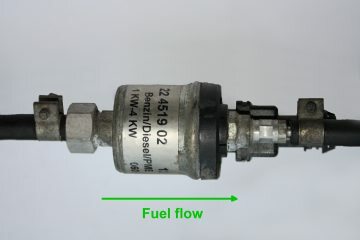 Eberspacher Fuel pumps come in 12v and 24v versions as well as several different supply rates. The Airtronic D2 and D4 use the same pump. 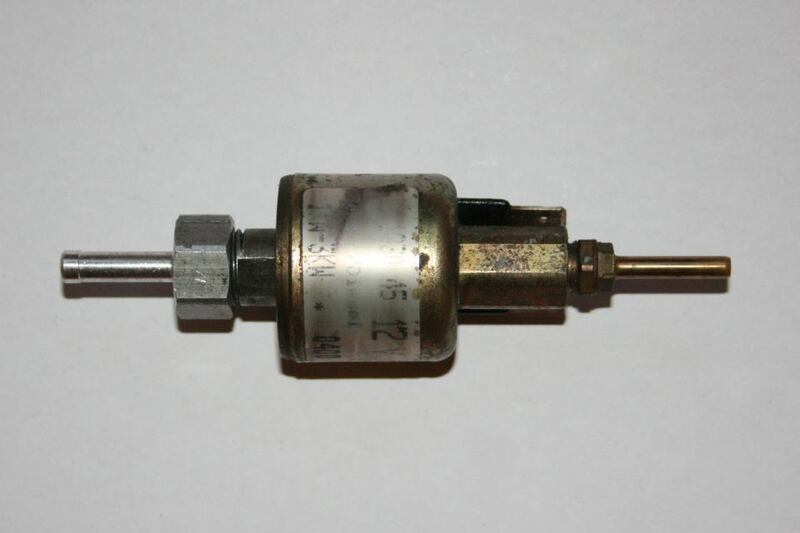 Pumps contain a fuel filter and a non return valve. Pumps are adjusted during manufacture to deliver the correct amount of fuel for each model so Eberspacher say pumps from a different model are not interchangeable. However if the correct pump is not available you sometimes may be able to alter the pump spring pressure to adjust it enough to match other models, see fuel fault 2 page. This adjustment is limited so do not expect a 3.1 - 5 kw pump to adjust to match lower heat pump versions. Do not buy Webasto pumps, more details on fuels page. It is very important to use the correct fuel pipe and to pick up the fuel at the correct point to prevent a lot of fuel related problems. Refer to the Manuals before installing, also see our fuel pages. Old style and the newer rubber fuel pump mounting brackets. The rubber version reduces noise transferring to the chassis. Fuel pump brackets front view. Air heaters have four M6 fixing studs and these are often rusted / missing. Fit locking washers, not Nylock nuts as the nylon can melt at high temperatures. 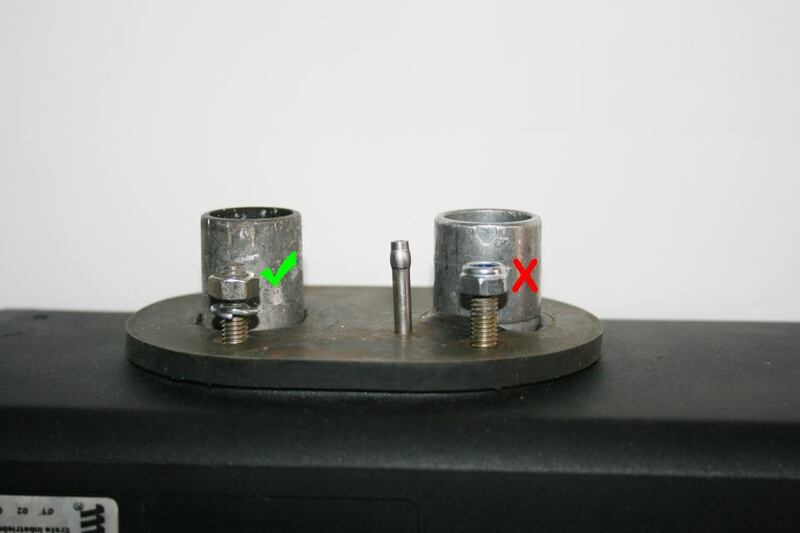 Do not replace studs with stainless steel versions, these can cause galvanic corrosion. Using stainless nuts and locking washers is ok.